Transport for London operate many services to enable people to travel around Greater London, but not all of their services are operated by Transport for London themselves. The only service which is owned and operated by Transport for London is the London Underground. 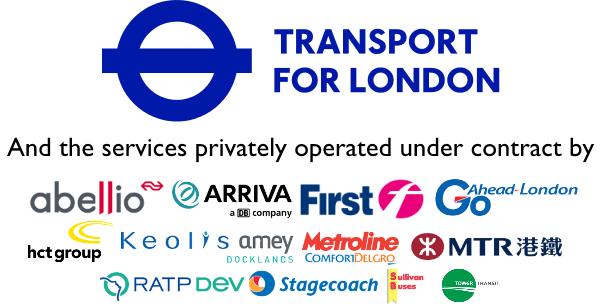 Not many people realise that most of the TFL services are operated by private companies which TFL contracted out. In this article I will show the main services which are being operated by private companies, I'll name their parent companies and give a brief history of the company. The London Bus operations are franchised by contracting routes on a term basis and using a tendering system. The competitive tender system started back in 1985 and private bus companies bid and win tenders to operate a route under contract to London Transport Buses. In 1988, London Buses was split into 12 business units and then in 1994/5 it became fully privatised and sold to private companies. Currently, London Buses operate a peak vehicle requirement of 7,856 buses. Prior to 1997’s 80% red rule, many private firms operated buses in their own livery colours instead of the usual traditional red, but after 1997 bus operators had to have their own buses painted 80% red because the non-red London Transport Bus services confused tourists and non-Londoners. Since 2011, all operators have had to have their buses painted 100% red but the logo of the private operating company is still visible on the side of the bus. Abellio is an arm of the Dutch national rail operator 'Nederlandse Spoorwegen' Their parent company is owned by the Dutch Government. Arriva is owned by 'Deutsche Bahn AG' which is also owned by the German Government. Go Ahead London’s current subsidiaries are London Central, London General, Metrobus, Docklands Buses and Blue Triangle. They are one of the original companies which brought the London Bus operating companies in 1994 during privatisation. Go Ahead’s parent company is Go Ahead Group. Their brand for London Bus services is CT Plus. ComfortDelGro is a multi-national land transport company listed on the Singapore Exchange. The name 'Metroline' has been in use since 1989 when London Buses split and formed operating companies, then privatised in mid 1990’s. RATP Dev owns London Sovereign, London United and Quality Line/Epsom Buses. The subsidiary of RATP Dev is RATP Group and their parent company is owned by the French Government. The name 'London United' has been in use since 1989 when London Buses split and formed operating companies, then privatised in mid 1990’s. Their subsidiaries are East London, Selkent & Thameside which operate under the Stagecoach brand. Stagecoach is one of the original London Bus franchises as they brought East London Buses and Selkent operations during the privatisation of London Buses during the mid 1990’s. In August 2006, Stagecoach sold their London Bus operations to Macquarie Bank at a price of £265 million. After it was sold, the bus operating companies brought back their own pre privatisation identity. Then in October 2010, Stagecoach brought back their London bus operation which was sold at the price of £52.8 million. Sullivan Buses have no parent company as it owned independently. It was formed in 1998. Tower Transit is a subsidiary of Transit Systems from Australia. Tower Transit was formed in June 2013 after buying three bus garages from First Group. London Rail manages the London Overground (LO), London Trams, Docklands Light Railway (DLR) and Crossrail. Transport for London owns Docklands Light Rail Ltd. Prior to 1997, it was a wholly owned subsidiary of London Regional Transport, which means the service was publically operated. 1992 it was transferred to the London Docklands Development Corporation, sponsored by the Department of Environment. Then post 1997, the DLR was franchised off to a private firm called Serco. It retained their contract in 2005 and then on 7th December 2014 the private operations were handed over to Keolis Amey Docklands under a new contract. DLR is a light railway service which serves the East and South East London, it began operations in 1987. The operation is a joint venture between transport operator Keolis (70%) and infrastructure specialists Amey plc (30%). Keolis is the largest private sector transport group in France. Keolis is 70% owned by Société nationale des chemins de fer français and (30%) Caisse de dépôt et placement du Québec, a Crown Corporation from Canada. Amey Plc’s parent company is Ferrovial, S.A. which is a multinational company from Spain. In Late 2007, TFL took over the Silverlink franchises which operated the North London Line, West London Line and the Watford DC Line. In 2010 the former London Underground East London Line became part of the London Overground network after it was closed in 2007 for major refurbishing and extension works. A private company which is responsible for the operations for the London Overground service. LOROL is a 50/50 joint venture from MTR and Arriva. 76% of MTR is owned by the Hong Kong Government, whilst 24% is owned by shareholders. The owner of Deutsche Bahn AG is the German Government. The owner of Tramlink is 'Transport for London'. Tramlink operates tram services in South London which began operation in May 2000. The tram operation is operated as a concession by Tram Operations Limited, part of 'First Group'. First Group operates the Croydon Tramlink service where their company name is Tram Operations Limited. Crossrail is a new railway line which provides an east-west route across Greater London. The full service will begin in 2019 and will serve stations from Reading/Heathrow to Abbey Wood/Shenfield via Paddington and Tottenham Court Road below ground. TFL Rail is the brand name for the Shenfield Branch prior to the full Crossrail operation. Operating company MTR Crossrail, which is a subsidiary of MTR Corporation is under majority ownership by the Hong Kong government, who own 76% of the shares. The remaining 24% are owned by shareholders. London Underground is the world’s oldest rapid transit system and was first operated in 1863. Between 1900 and 1902, the Underground lines were operated by individual companies and they merged to form one company called Underground Electric Railways of London Company Ltd. (UERL). In 1933 a company was formed from all the bus, tram and underground companies, it was called London Passenger Transport Board (LPTB). In 1948, London Underground was nationalised under the control of London Transport Executive. Rolling on towards 2003, London Underground was reorganised in a Public-Private Partnership where private infrastructure companies (infracos) upgraded and maintained the railway. One of the infrastructure companies is Metronet. Metronet was responsible for the Sub Surface Lines (Circle, District, East London, Hammersmith & City & Metropolitan lines) and Bakerloo, Central, Victoria and Waterloo & City lines. From the 18th July 2007 to the 26th May 2008, the company was in administration and on 27th May 2008, the company responsibilities were transferred back into public ownership under the authority of Transport for London. The failure of Metronet cost taxpayers up to £410 million. Tube Lines Ltd is a 2nd infrastructure company established under a Public-Private Partnership scheme in 2003 but brought by TFL in 2010 following a funding shortfall. During mid 2010, TFL had agreed to buy the shares of Bechtel and Amey (Ferrovial) from Tube Lines for £310m. Combined with the takeover of Metronet, this means that all maintenance is now managed in-house by TFL. The company is responsible for the infrastructure for the Jubilee, Northern and Piccadilly Lines. Thankfully, the services of the London Underground are under public ownership. The reality is that TFL tendered out the services to private companies in order for them to make revenue by operating a service for TFL. But a fraction of your fares go to profits for the private operating company, but the majority of the fares go back to running the services. It’s also quite ironic how some of the companies are owned by governments from different countries. Hopefully this article has shown you how the operations of TFL are provided by private companies. If you think TFL services should be run by public operators, feel free to express your opinion below.